It is because these problems are usually pretty obvious and cannot be ignored. Anyone who has discovered an oozing, stinking ear infection or a chewed-bloody-and-bare hot spot will tell you that these are BIG hard-to-miss symptoms that something ‘not quite right’ is going on. The same cannot be said for internal problems, which can be sometimes hard to detect in furry ones who are evolutionarily hardwired to hide their illnesses. Inside every dog and cat is an amazing system that works day and night. When things start to go sideways, it isn’t always obvious, especially since they can’t verbally tell us what’s wrong. Judging from the popularity and diversity of forensic-crime dramas on TV, the public holds a diehard fascination with the process investigators and coroners use to solve medical mysteries. Their job is difficult because the ‘patient’ can’t talk. Welcome, my friends, to veterinary medicine. While the symptoms of internal disease might be difficult to detect, they are there if you are aware of what to look for. Catching problems early on usually translates into better prognoses. If you notice any of the following signs, or if your gut tells you that something isn’t quite right, schedule an appointment with your veterinarian as soon as possible. Be observant. Essentially, become a student of your pet. Really step back and look closely at your companion animal, to determine what is normal. Any long-term human caretaker will tell you of the benefits that can come from using a journal to record basic observations (weight, activity, appetite, etc.). Make a note of any changes in appetite, drinking, urination and defecation. If you free-feed, be aware that judging variations in appetite can be more tricky than if you precisely measure food. Always leave out plenty of fresh water, but notice if your pet is drinking more - increased water consumption can be an early sign of diabetes, kidney disease or hyperadrenocorticism. Be aware of your pet’s elimination habits - is he or she urinating more or less? Are there any changes in stool? 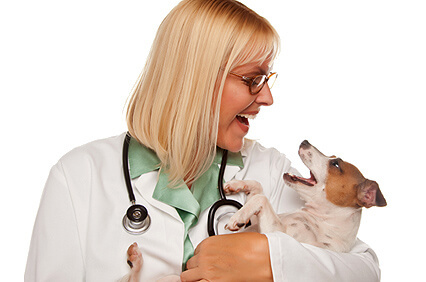 The bottom line is, any unexplained changes in activity level should be recorded and reported to your veterinarian. Sometimes skin and coat changes can be a clue to a deeper problem. Repeated skin infections and hair loss on the tail can be symptoms of hypothyroidism. Patterned hair loss, tumors, changes in pigment or in the texture of the skin are signals that it is time to see your veterinarian. Weigh your furr-kid every month or so. The easiest way for most folks is to stand on the scale to get your weight, and then stand on the scale holding your dog or cat and calculate the difference. If you have a big dog, I can tell you that most veterinarians would be happy to have you drop by and use their scale. While a pound lost or gained may not seem like much, in a 10-pound cat or dog it is significant. Any weight changes that are unexplained should be checked out by a veterinarian. Hi Dr, I have being noted that my dog is eating dirt, every time I let him go out I find him like eating when I go and check it was nothing there only sand or dirt. What is that mean? Eating dirt actually has a name - geophagy. Many people express disgust or surprise when they see their dog eat dirt, but this action is actually commonplace amongst many dogs. While not every dog will eat dirt, many will given certain situations. First - make sure your dog isn't licking or eating something on the dirt. In many other situations, your dog will appear to be eating dirt but may actually be eating something that lies in the grass or on the ground. in these situations, the dog will likely not eat very much dirt at one time and it will only be a one time thing. Remember that your dog can smell food that is buried under the ground significantly better than you can. If you notice your pet eating dirt, it's not necessarily a bad sign, but it could be. Keep a close eye on him to watch for other telling behaviors that can show you that he's eating dirt due to an underlying medical condition, such as a mineral deficiency or stomach upset, that you need to address. I love what you guys are usually up to, this sort of clever work! Keep up the amazing works guys! I've included you in my own blogroll. Howdy! Someone in my Facebook group shared this website with us so I came to give it a look. I'm definitely enjoying the information. I'm book-marking and will be tweeting this to my followers! Superb blog and excellent design and style. My 12 year old Lab eats dirt and then gives it back to me usually in the middle of the night. She is otherwise healthy. My little Pug has had a persistant urinary tract infection and was treated all last summer with various antibotics until she was old enough and big enough to finally be given Baytril. This cleared it up but I am very vigilent and feed her only canned food and force extra water in her meals. I hope this is not going to be a on going problem for us. She still has some crystals so we continue to have her checked.